John Hovis's Wee Tennis Balls: So...What Now? The U.S Open is over. 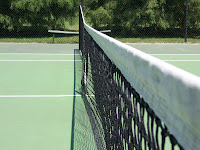 Davis Cup is upon us (I can feel another post coming on soon...) and there are no slams until 2013. Where does it all leave John Hovis? His head is spinning. My thoughts, in summary. The moment arrived for the muzzard. A moment John Hovis claimed would never happen: to be fair to JH, it didn't happen for a very long time. A very, very long time. Although not a fan of muzzard, John Hovis offers congratulations to him for his victory. Photo courtesy of karlinorling via Flickr with thanks. It was an odd victory in an odd slam. Murray didn't play particularly well throughout and only the win against Hovis's pet Raonic stood out. He played well in patches against Djoko and overall deserved to win the final, although I've seen him play far better and lose in slams. The usual meddling pesky stars lined up for Murray. No Nadal, a strangely subdued Fed tamely surrendering to Birdo (a semi-nemesis for the great man), a frailer than usual Djoko. Hardly a classic tournament. A fairly exciting final didn't cover up the fact there were no genuine epic man-on-man battles in the tournament. Yes, there were comebacks, comebacks which lacked the classic spark and (vitally) the highest quality tennis. The weather didn't help. Blistering heat sapped even the fittest of players. Wind and rain followed, making certain courts far quicker than others. The wind was a huge factor in Murray's ultimate victory. Berdych, with his flat style couldn't hack it. Djokovic looked unsure of himself in the blustery surroundings, which cost him the first set and ultimately, the title. The key difference in Murray's game over past finals was increased self-belief coupled with an improved serve. 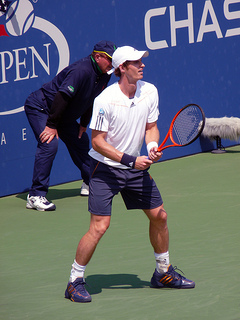 The serves drove Djoko wide when Murray was under attack; the first serve held up in the final set (over seventy percent). Lendl can be heartily congratulated for Murray's reinvention. Good fortune favours the brave and all that, with Murray's horizon now full of pretty flowers and dancing kittens. What would have happened had he lost a fifth consecutive final? The sniping at Lendl would have been in full swing, especially following Murray's travails in earlier rounds when a return to the bad old ways seemed in full revival. Murray himself may not have recovered from a fifth slam final defeat. Again, odd to think it wasn't any where near his best performance, yet it was the one which rescued his career. What a great sport tennis is. Another winner is Serena. Yet more magnificence, yet Hovis was impressed by Azarenka who matched her off the ground. Serena's time at the top (despite what the rankings say) may be short. Azza will have to go away and work on her serve over the winter months. Even when working, it fails to trouble the likes of Serena Williams. Aces for Azza are a rarity, easily returnable seconds are not. The Open was also a good fortnight's work for the little beast Ferrer. Who knows what may have happened should the weather have held in his semi v Djoko. Probably a right good thrashing in the final. Nevertheless, another solid tournament from Mr Consistent. Delpo - I'm including him here because his season has been one of a steady upward trajectory. A good hard pre-season and injury free spring may see Delpo back in among the big boys next year. He should have taken the tie-break against Djoko, then quickly lost heart. It could have been all so different. Much as it pains me, a poor tournament from Fed. Easily the form player on hard courts going into the Open, he was brushing aside his opponents with ease. The serve was operating, all was well. The missing Fish match, the lack of the battle in the opening rounds, the wind and an in-form semi-Fednemesis in Berdo all conspired to depress the great man. There was an air of despondency in his post-match presser. He knew he could and should have done better, despite the fact that Berdie played well. In Hovis's opinion, a tough season has left Fed slightly drained and he lacked that extra gear he usually finds when required in a tough match. It must also be noted that windy conditions are tougher from Fed due to his stick; the ProStaff requires absolute precision due to its head weight and miniscule size. Wind coupled with a misfiring forehand leads to calamity. Hovis was almost glad he wasn't in the semi as the crazy conditions that day could have led to a solid beating from Murray, who tends to adapt well in windy condition due to his style of play and favoured tactics. Mardy Fish - a sad withdrawal, which also hindered the Fed and the tournament at large. Let's hope we are not witnessing the end of Mardy's career. Worrying. Milos Raonic - failed to step up. Puzzling tactics on hard courts for a guy who could be an immense serve/volley champ or at least a punching, hard serving aggressive heavyweight. Note to Blanco (Milos's coach)...dirt rats don't prosper on proper tennis courts. Sort it out. Hovis is still waiting (and there is plenty of time) for the breakthrough result. More work required. Tomic - As Pat Rafter said, his performance and attitude against Roddick was 'disgraceful'. Tsonga - Oh dear. Must try harder. His promise is beginning to melt just as Murray steps up. Big choices to be made for Tsonga over his chilly winter of the soul.